Home > Uncategorized > What’s on Your Community Calendar? 1. 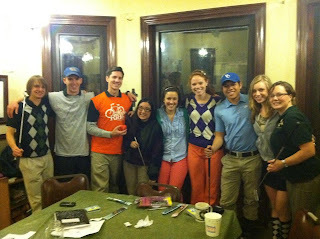 Theme Nights- The Colorado Vincentian Volunteers planned a Golf Night. They pulled out all things argyle, borrowed clubs from their program director and set up a mini golf course around their house. I’ve also heard stories of DayGlo, stretch pants and teased hair for an 80’s Night complete with the Wedding Singer soundtrack blasting in the background. The possibilities are endless. 2. The Myers Briggs Test – Taking this (or another similar assessment) can be a great way to start conversation about your personalities and how you interact with others. It is a fun way to learn more about yourself and can be a huge help in addressing conflict within the community. 3. Affirmations – Take some time for each person to write down/brainstorm things that they really appreciate/ admire about the other community members. Then share them with that person and the rest of the group. This is a great end of the year activity, but can be helpful during mid-term struggles too. 4. Food Creations- volunteers with the Episcopal Urban Intern Program decorated these Gingerbread Houses one night. At my house, we had a popcorn night, where we brewed up some plain popcorn and added toppings ranging from garlic salt to caramel. 5. Game Nights- cards, riddles, sports and of course… board games! Need I say more? The Cabrini Mission Corps volunteers particularly enjoy Quelf, Telestrations and Cranium Hullabaloo. 6. Guest Speakers- invite members of local organizations, religious orders or other volunteer programs to talk about a social justice issue or another topic that you want to learn more about and then discuss your thoughts on the lesson. 7. Star Gazing- whether on a city rooftop or a country field, try removing yourself from the technologies of your house. Maybe start your night in silence and then let the spirit guide the meditations of your heart and conversation. 8. Arts and Crafts- if only I had a picture of our living room in mid-December when we were making Christmas gifts. There were fabric scraps, shreds of paper and glitter EVERYWHERE! Messy? Kind of. 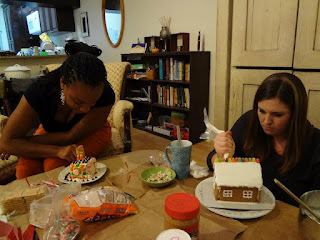 But it was a fun way to learn from each other’s artistic talents and saved a ton of money in gift giving. 9. Going on a Night Hike- through the woods, on a beach, up that big hill in your city… don’t forget your flashlights! 10. Larger Community Night- invite individuals from your local area into your home for dinner. These could be neighbors, co-workers, spiritual leaders, or individuals that you serve (keeping in mind appropriate boundaries of course). I hope you’ve found an idea or two to bring back to your community. Send us an email with ideas for community faith-sharing activities at [email protected].